Blueberries can be considered the all-purpose berry: They're reasonably priced, beautifully colored, delicious, and ideal for eating by themselves as a snack or in cereal, smoothies, salads, muffins, or pies. A flowering plant, blueberries are in the genus Vaccinium, which also includes cranberries, bilberries, and huckleberries. Blueberries, including both wild (lowbush) and cultivated (highbush) varieties, are one of the few fruits that are native to North America. While the first commercial crop of blueberries wasn't harvested until 1916, the fruit is now available year-round: The North American blueberry season runs from April to September, but imports from South America—where the seasons are reversed—are available from October to March. One cup of raw blueberries contains about 80 calories and 21 grams of carbohydrates. It also yields nearly 4 grams of fiber. Though a cup of blueberries contains nearly 15 grams of total sugar, its glycemic load, which factors in how much of a particular food will raise blood sugar levels, is below 10, which is considered low. Blueberries contain just a trace amount of fat and are cholesterol-free. Blueberries have a minimal amount of protein. You should include other protein sources in your diet to meet your daily needs. Blueberries are a rich source of essential nutrients, including vitamins C and K and the mineral manganese, which helps the body process cholesterol and nutrients like carbohydrates and protein. Vitamin C acts as an antioxidant, aids in wound healing, boosts immunity, and has anti-aging properties. Vitamin K is a key nutrient in blood clotting and healthy bones. 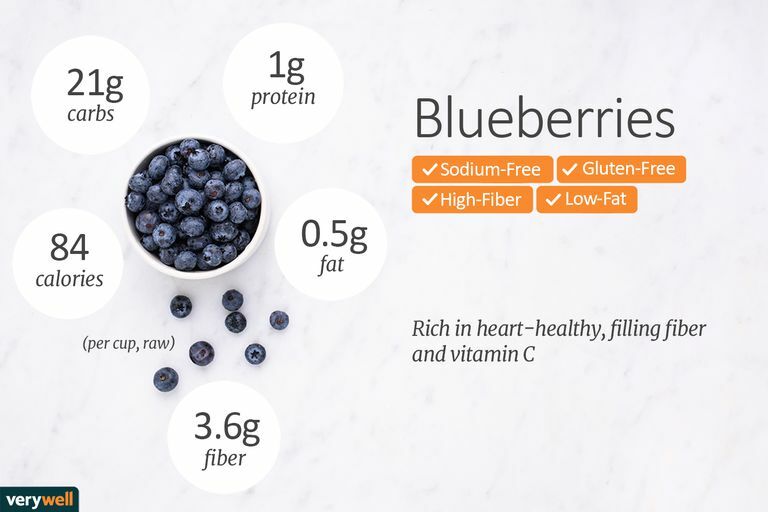 Blueberries also abundant in phyto (plant) components, such as flavonoids, which are responsible for their antioxidant and anti-inflammatory activities. Blueberries may be small but research shows they're mighty at helping to preserve good health. Besides proving to help maintain memory and prevent cognitive decline, blueberries seem to promote heart health: In one study, eating three or more weekly servings of berries like blueberries reduced the risk of heart attack in women by 32 percent. Blueberries are so beneficial in part because they're rich in heart-healthy, filling fiber. Fiber is the indigestible part of carbohydrate that aids in satiety, helps to regulate bowels, assists in pulling cholesterol away from the heart, and helps stabilize blood sugar. The fruit also contains compounds known as polyphenols, which are sort of an all-around handyman for good health. Blueberries specifically contain anthocyanin, an antioxidant that may benefit the heart by improving blood flow and countering the buildup of plaque. Eating foods with anthocyanins may also help to fend off cancer. How do I shop for blueberries? Choose firm, dry, well-rounded, smooth-skinned berries that are bright blue with a slightly frosted look. Reddish blueberries aren't ripe and won't ripen once picked, but you can use them in cooking. Avoid berries that are soft, shriveled, or have any sign of mold. Once you get them home, refrigerate fresh blueberries and eat them within 10 days. Will I get the same nutritional benefits from frozen blueberries? Generally speaking, yes. Fruits and vegetables that are going to be frozen are generally picked at peak ripeness, when they're the most nutritious, and research shows that freezing helps preserve their nutritional content. Do wild blueberries taste the same as store-bought berries? Wild berries are smaller than their cultivated cousins and have a more intense, tangy flavor. They also contain more antioxidants than cultivated berries. This versatile fruit can be used to make almost anything. Blueberries can be incorporated into baked goods like pancakes, muffins, pies, and crumbles. They can be eaten with yogurt, cottage cheese, oatmeal, or blended into smoothies. Toss them into salad for a refreshing colorful addition or just pop them straight into your mouth as a delicious snack. Blueberries are a natural source of salicylates, so if you're allergic to these chemicals—they're the active ingredient in aspirin and are found in other foods and personal-care products as well—you should eat blueberries with caution (some people are more sensitive to salicylates than others). Blueberries may interact with some medications. In addition to salicylates, which act as a natural blood thinner, blueberries are loaded with vitamin K, a nutrient that's important for blood clotting. If you're taking a blood thinner like Coumadin (warfarin), talk to your doctor about the effects of eating foods high in salicylates and vitamin K on your medication. Cassidy, Aedin, et al. High Anthocyanin Intake Is Associated With a Reduced Risk of Myocardial Infarction in Young and Middle-Aged Women. Circulation. 2013;127:188–196. National Institutes of Health, Office of Dietary Supplements. Vitamin K.
United States Department of Agriculture. National Nutrient Database for Standard Reference Legacy Release. Raw blueberries. U.S. Highbush Blueberry Council. About Blueberries.